Last year, I had such a great experience participating in the Central Florida Fair Confectionery Arts Competition so I had to enter again this year. For a recap on last year’s fair, check here and here. This time, though, I entered 7 different categories in the professional division! 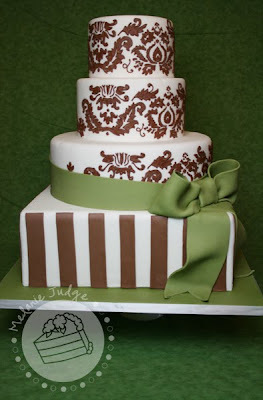 My “holiday cake” entry was 4 tiers, with the top 3 tiers being round and the bottom tier being square. 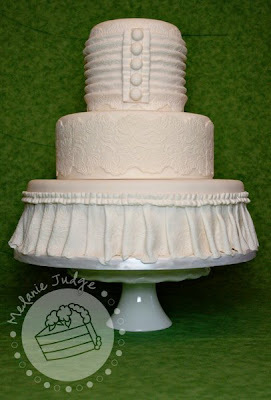 I decorated the top 3 tiers with damask piping. First, I drew the pattern I wanted to use on paper. 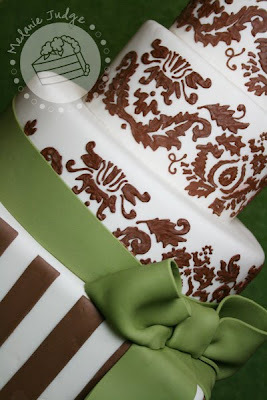 Then, I used graphite paper (it’s non-toxic) to transfer the pattern onto the sides of my fondant-covered cakes. And the piping was all done with brown royal icing. 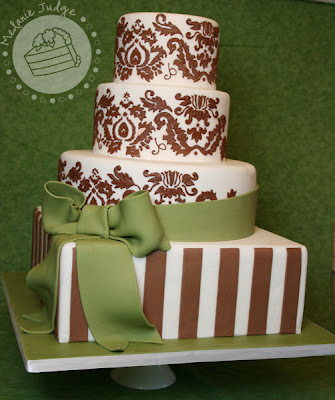 The bottom tier was decorated with simple brown fondant stripes. And the big green bow was created out of a fondant/gum paste mix. UPDATE: This cake won 3rd Place in the Professional Adult Holiday/Special Occasion Cakes category. UPDATE: This cake won 1st place in the Adult Professional Misc. Cakes category. 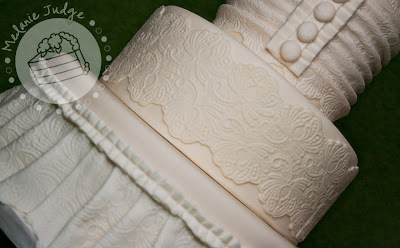 It’s supposed to resemble a bride’s dress and it was decorated only using ivory fondant! 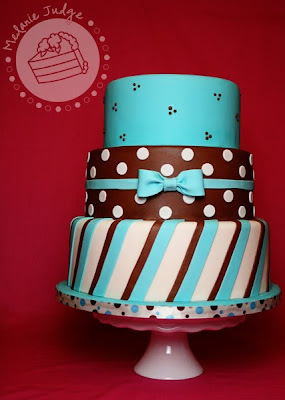 This cake was so easy to make so I’ll do a tutorial of it for you soon. You’d be surprised at how few tools are needed to complete it! UPDATE: This cake won 1st Place in the Professional Adult 3-Tier Wedding Cakes category. I also brought the Shrek cake from last weekend’s Panhandle Cake C.R.U.M.B.S. 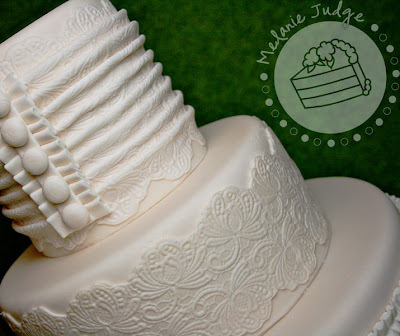 Fairy Tale Cake Decorating Competition and entered it into the “4 tiers or more wedding cake” category! UPDATE: This cake won 2nd Place in the Professional Adult 4+ Tier Wedding Cakes category. 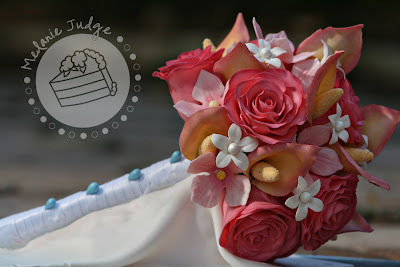 And remember the gum paste flower bouquet I brought to the 2009 ICES Convention in Illinois? Well, I brought those along too. UPDATE: No ribbons for this entry in the Professional Adult Specimen Flower category. 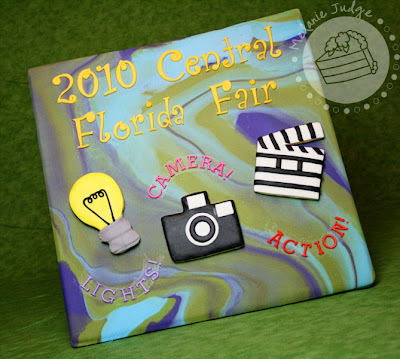 When I registered for the fair competition, I had great ambitions for creating some adorable decorated sugar cookies. But time just got away from me so I created this to go along with the fair’s theme this year of “Lights, Camera, Action!” It’s nothing special…but who knows, it may still win a ribbon! UPDATE: This cake won 1st Place in the Professional Adult Decorated Cookies category. And my last entry was homemade chocolate chip cookies. I don’t have much hopes for getting a ribbon for those after seeing the other cookies that were entered into the competition. Yes, chocolate chip cookies are a classic, but can they really stand up to snickerdoodles, peanut butter drops, chocolate-chocolate chip cookies, etc? We’ll see! UPDATE: This cake won 3rd Place in the Chocolate Chip Cookies category. 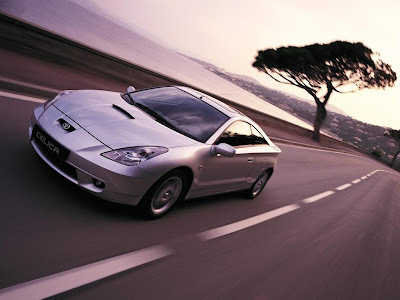 Of course, this one isn’t mine…mine needs a new paint job and window tinting…but it’s a cool photo, isn’t it? UPDATE: Jessica’s cake won 2nd Place in the Adult Amateur Theme Cake category. In early March, I’m heading back to the fair to pick up the entries. 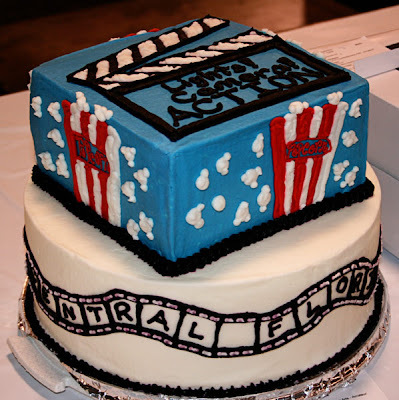 Then I’ll post some winners and my favorite cakes here for you all to see! Girl, you are truly an artisan! Your work is immaculate, creative, and exquisitely executed. I don't know why you are working for someone else but hopefully it is just to get some more experience and to get your name out there because you are already better that a lot of other business owners. Post more photos of the Shrek cake! I love it but I want to see both sides better!! !